Review for SD Bullion, Bad Customer Service - I don't recommend you do business with them. Bad Customer Service - I don't recommend you do business with them. I ordered product Nov 30, paid for it with wire transfer, and finally received it Dec 28. 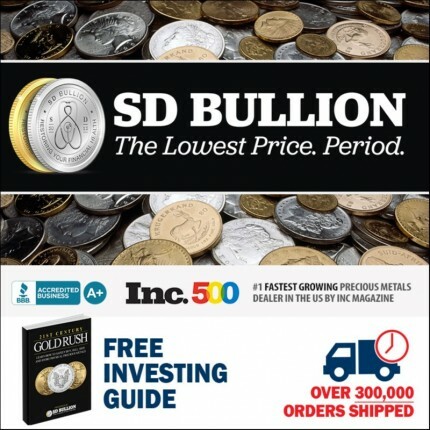 On Dec.1, I emailed the website I accessed to do the purchase to ask where to send the money and received an answer that said he new the owner and forwarded it to SDBullion. I repeatedly used the contact forms on both websites to say I had not received an email confirmation of the sale and did not know where to send the check (I was going to pay by check, but later changed to wire transfer to speed things up.) On Dec 14 was my first contact from SDBullion after the order. They finally contacted me by phone and we figured out my email address was not working for them. I went to my bank to wire transfer the money on Dec 15. Every day after that I was waiting at home to sign the delivery form. On Dec 20. they gave me a tracking number that turned out to be wrong. On Dec 23. I got a second number that was supposedly attempted delivery that was refused. I had their phone number by then and called on Dec 23. They said they still had my package in their office and would send it. I got a third tracking number on Dec 25 to be delivered on the 26th. Then I was told it was not coming. Then I got a fourth number and it was finally delivered on Dec 28th. Totally ruined my Christmas holiday sitting at home frustrated, waiting for the delivery wondering if order was actually coming. We have reviewed your account. The main issue appears to be you had blocked our email so that you didn’t receive any emails from us nor could you send any out. We show we didn't receive any contact from you until Dec. 14th. You then acknowledged this on the call with one of our support representatives that by blocking our email you blocked all of our correspondences. Furthermore, after reviewing your account further, you admitted this was mostly your fault, however you continued to blame our company for not receiving any communication. All of our systems are built for sending email notifications (we do not use auto phone dialing) to keep customers up-to-date with the status of the order. By blocking email correspondences from an online e-commerce bullion dealer, there is very little we can do as we are not staffed to call people continuously over the phone. Here is the details on your account regarding the order. Your order was placed on Nov. 30th, customer didn't send payment until Friday Dec. 15th. We shipped this initially on Dec 19th. Final delivery time was longer due to the holiday, but this was not in our control. Customer was sent an initial tracking email automatically from our system (but customer had our email blocked). Tracking numbers were relayed to customer over the phone, but apparently there were issues in translation which is why we highly recommend email as the preferred communication tool. The initial shipment address did not have the apartment number, so the package was returned to us. This was corrected and reshipped the following day at no cost to the customer. The package was expedited and resent so that the customer received the package the next day after the address was updated to include the apartment number. The package did ultimately arrive after the holidays given that it had to be shipped twice. We sincerely apologize that the order missed our standard processing time to arrive before Christmas. The payment not being submitted for 15 days after the initial order was well beyond our normal payment terms, but our team approved an extension in hopes of satisfying you as the customer. I have reviewed your account. The main issue appears to be you had blocked our email so that you didn’t receive any emails from us nor could you send any out. I show we didn't receive any contact from you until Dec. 14th. You then acknowledged this on the call with one of our support representatives that by blocking our email you blocked all of our correspondences. Furthermore, after reviewing your account further, you admitted this was mostly your fault, however you continued to blame our company for not receiving any communication. All of our systems are built for sending email notifications (we do not use auto phone dialing) to keep customers up-to-date with the status of the order. By blocking email correspondences from an online e-commerce bullion dealer, there is very little we can do as we are not staffed to call people continuously over the phone. We sincerely apologize that the order missed our standard processing time to arrive before Christmas. The payment not being submitted for 15 days after the initial order was well beyond our normal payment terms, but our team approved an extension in hopes of satisfying the customer.